The minimalist guide to vol biv adventure equipment! It is a good time to write this, as I am replacing just about everything as it is all worn out! I’ve been flying a Gradient Montana paraglider, 26 square metres, 4.1kg, EN B which is “fun class” (between “beginner” and “sport”). 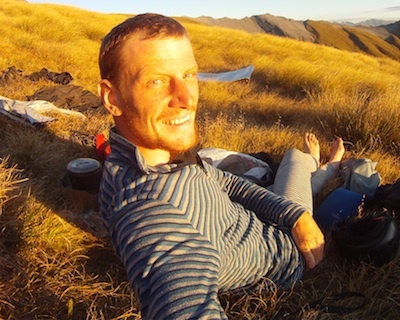 It’s rated 75-95kg so I’m a little over the top of the weight range with overnight gear and food. This tends to make it more responsive, a little faster, more dynamic and MORE FUN! Yes my glider is in that bag! 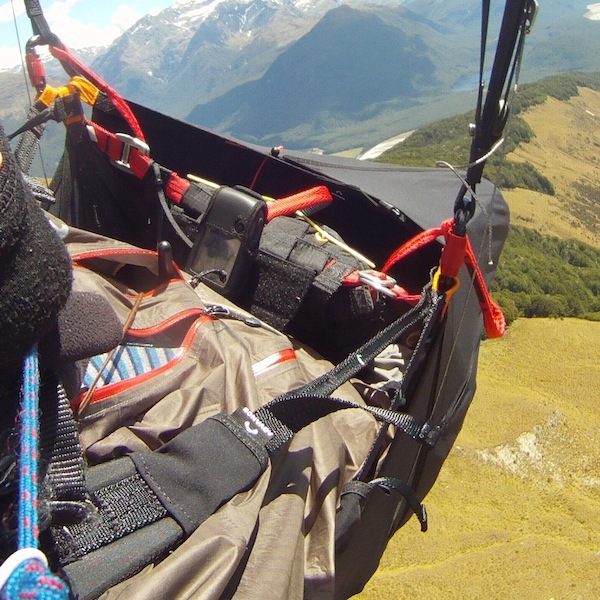 The harness is a Sup’Air AltirandoXP (size M). It folds inside out and turns into a backpack, so for dual purpose the weight of 3kg is pretty good. Only problem is when you wear out the backpack, you wear out the harness. It’s reasonably comfortable as a backpack – I can go all day – it just squeaks and groans a bit with a full load! As we speak it is pretty much in tatters (after multiple repairs), so I am waiting for my new Advance Lightness to arrive, it will be my first pod harness. Key advantage I hope is that speed bar is easier to use, and also it should be heaps warmer for those chilly high flights. Oh, and performance can come in handy sometimes! The bag is separate too so I can get a bigger one that is more durable for overnight trips. 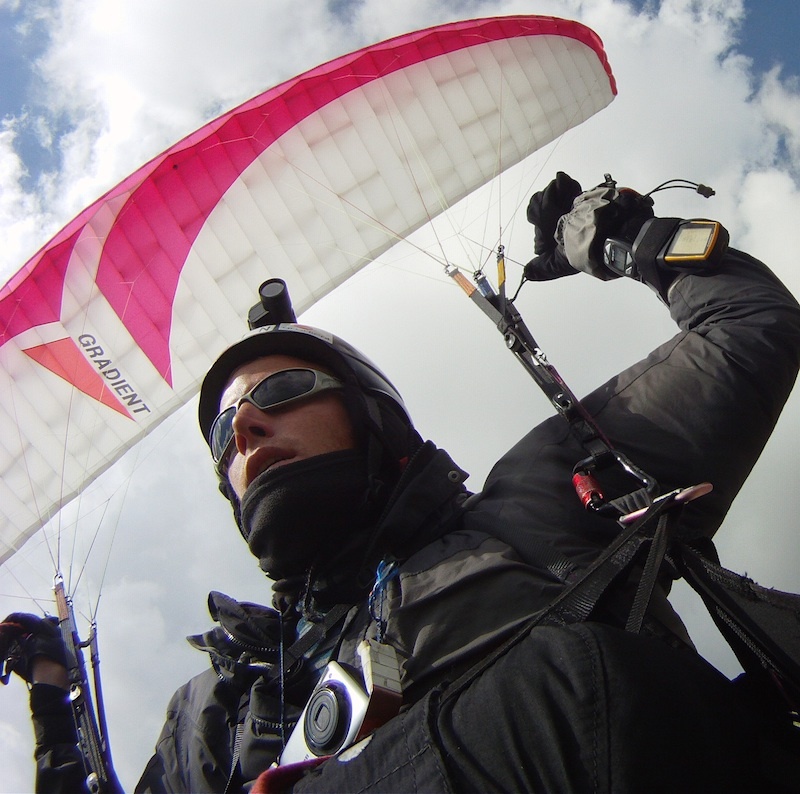 My reserve parachute is a Sup’Air lightweight, it only weighs just over a kilo. Therefore you can see my flying gear is pretty light, there are a few other little things (stirrup and speed bar) which gradually start to add up though. The lighter my gear the better, and if it is multipurpose that also helps. Meanwhile I’ve just bought some new Asolo Granites 46+1/3rds, they are a similar thing to the Makalu’s (semi rigid mountaineering boot), and look damn impressive. I’ve seam sealed the sole / leather boundary and they are ready for action. 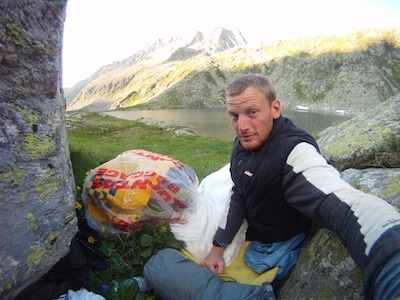 Clothes – in my waterproof blue stuff sack, they double as a pillow. Although usually I’m wearing all of them at night to keep warm! I will have one sun shirt and one thin light tshirt (not cotton, something synthetic that squeezes dry). Full length polypropylene layers (or better still, wool – which we use in Antarctica – it’s also good because it doesn’t melt), two for the upper body (one has zip neck). A down vest, because it is light and multipurpose since I don’t have a sleeping bag – I just have a polypropylene sleeping bag liner (fist sized when packed), which is for comfort and helping set up a warm microclimate. Other essential items – belaclava (thin polypropylene, and wool hat) always the best value warmth to weight. Basic polypropylene gloves, a neck warmer, and overmits for flying. Only one spare pair of socks – wash and dry it whilst wearing the other pair (same for underwear, shirt). Boardies (shorts) because they are durable for everyday use and quick dry. Waterproof breathable overtrousers, gaiters, and a thin light waterproof breathable raincoat. So for sleeping I sometimes lay out my yellow plastic bag pack liner that is supposed to be an emergency sleeping survival thing (it’s too short!). This is a ground sheet, above that a cheap foam sheet (which I have now replaced with something I can fit into my new pod harness whilst flying). Then I neatly unfold the glider, put the leading edge into the glider bag to keep it together and avoid wearing out the most important part of the glider. The concertinaed layers help trap the heat – 50 sqm of fabric trapping air! Trick is you often are lazy and don’t completely cover yourself to save making a mess, and pay for it in the last cool hours of the morning. But this helps you get up early, and I always say you are sacrificing comfort during the night for comfort during the day – in summer the nights are short! I also use an old tent fly to erect a makeshift shelter. 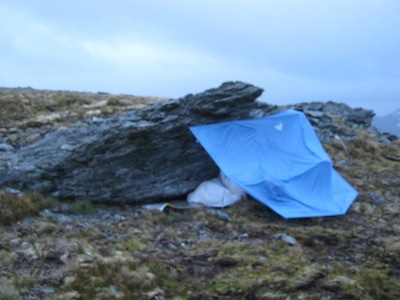 This has saved me in the past but it is generally intended as a fine weather shelter – if the weather is no good, you are better off finding a hut or bivvy rock! I sometimes use my lightweight ice axe to help pitch it. During the day it comes in handy as a pack cover. The axe is invaluable for transalpine trips of course, but also has these other uses, digging toilet holes for example, general impressing the girls, or my mate even uses his for cutting cheese! I’ve just bought a purpose made bivvy bag, very light, but I haven’t tried it yet and the real test is how breathable it is. The much shorter airline baggage plastic bag, that often cops a fair bit of abuse to protect my fragile harness when surrendering it to baggage handlers, is used to keep the dew off my harness while I sleep. Inside I stick my day bag with all my instruments etc, which should be vaguely waterproofed anyway. My instruments and other miscellaneous gear are what really pushes the weight up. I’ve tried to standardise on AA batteries, to carry just one spare pair for my $100 eTrex GPS (just upgraded with a $300 Garmin eTrex 30! ), SPOT messenger satellite bacon ahem beacon, Petzl headlamp, and basic Canon $100 camera hung around my neck. I have a lightweight snowboarding helmet with an attachment for my ContourHD video camera, the more versatile GoProHD goes in my pocket for photos or sometimes handheld videos. I managed to find a USB in – USB out battery pack to help recharge these and my wrist mounted vario. Sometimes I will bring my UHF radio, mounted on a lanyard around my neck. Varios, which beep when you go up, are the lightest available in my case. My old brauniger helmet mounted sonic only vario always used to get over excited (leading to extra stress at times perhaps!) but finally it used to jump octaves like its voice was breaking, and it got too distracting – so I got an Ascent wrist vario – main problem comparatively being the battery life (say 12 hours rather than 18 months), and the fact the m/s climb rate readout seems to be consistently wrong! Electronics… bah. Generally the point of the vario for me is solely the beep – I even prefer to use the climb rate from my GPS, updated once per second, along with elevation, ground speed, time of day, and distance to waypoint. The eTrex H has been great – good battery life and generally reliable, but I have had my share of GPS problems too – did I mention not to rely on electronics!? Add to this passport, wallet, iPhone 4 with battery-case, deodorant, sunscreen, first aid / toiletries bag, knife and spoon, sunglasses, maps, battery chargers or foreign plug adapters and cables, and slowly but surely it all becomes a rather heavy lump of a day bag. Finally there is food. In Europe I don’t bother with a cooker – you can buy hot food if you want to, and the bread is second to none. But for longer trips, pasta and rice meals are unbeatable for packing size / weight / value. Also couscous is like magic. Moir’s guide is accurate – low fat food is simply a waste of pack space! Favourites are cheese, salami, nuts, chocolate, and any item with >;2200kJ/100 grams! A single one litre bottle of water usually suffices as there is water everywhere in the mountains, but a secondary bladder is a great thing to have. I like to have a few mouthfuls of water available at all times but I don’t see the point of carting water up and down hills – that stuff is 1kg per litre! 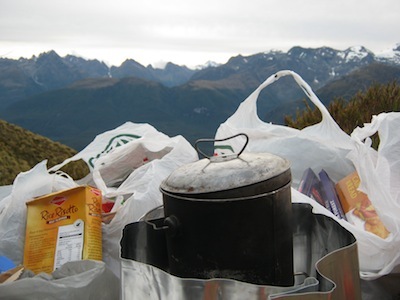 Rehydrate with meals and drink your fill plus two cups before starting on a climb. 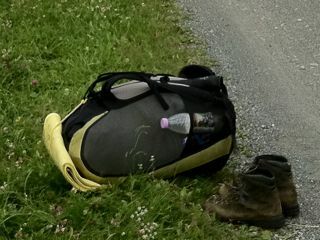 Just remember, gear just needs to be functional, think about what it needs to do and whether you really need it – don’t get carried away otherwise you’ll just end up with a heavy pack! Like it Nick, interesting how little can get away with. I notice that you are using a Exped Synmat UL 7S. How are you finding it? My first one delaminated but thankfully Mainpeak replaced it for me without dramas. It looks like the replacement maybe have had the design rejigged.